Description: A fine afternoon of Multiplayer logging on Black Mountain with GreaserSnoopy and Ag Jr. Which truck has the best paying load? 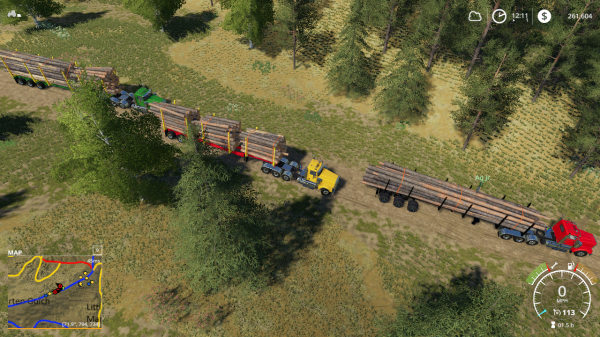 For FS15 the long logs were worth a lot more money, but for FS17 and FS19 the length does not seem to be as big of factor. Still I would rather have the logs on the red truck for full length house logs. I would probably have to re-dog those logs twice on our little sawmill though . I read somewhere that there is a scaling system in place where the max pay is the same for 6-11. After 11 it drops off and under 6 it does also. We pretty much proved it today. The red truck with the 18's was $52,000+, The green truck with the 12's and the front bunk mixed 5's and 6's (by far the heaviest load) was $92,000+, The yellow truck with 2 decks of 5's and a deck of 6's was $97,000+. that was crazy would have never expected it to go that way! on the road again just cant wait to get on the road again, sweet log hauling adventure, build a log home with them.